Here's a great little deal! 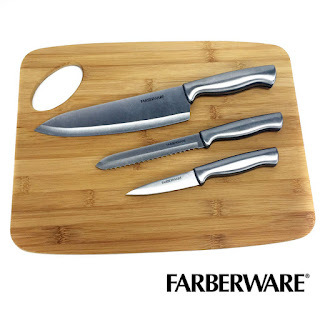 6 Piece Bamboo Cutting Board and Stainless Steel Farberware Knife Set $19.49 (Retail $46). Bamboo is the earth friendly choice! Right now 13Deals is having a End Of Summer Clearance Sale, plus get an extra 10% off of $25 or more with code SUMMER2015 at checkout. Plus Tons More! Head over and browse around for your favorites! Walmart has some hot deals on camping value bundles! For instance you can get this Ozark Trail 10′ x 10′ Instant Screen Canopy with 2 Chairs Value Bundle for $89! You'll find everything from tents to coolers to airbeds. Head over HERE to check out all of the deals. My daughter loves everything pet related! 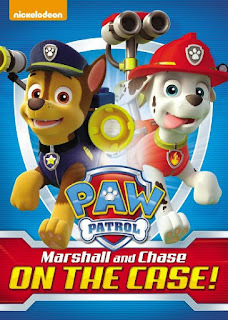 Right now you can get this Paw Patrol: Marshall and Chase on the Case for ONLY $7.99 (Retail $14.98)! 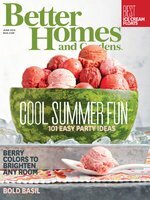 Ending today, Sun, Sep 20th, choose from over 100 titles for only $4.80/year at Discount Mags! 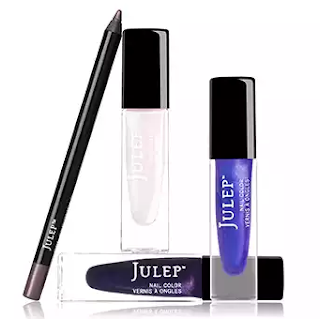 Join Julep Maven today to get this new Ombre Welcome Box – valued at over $50 – for FREE (just pay $2.99 shipping) with the code: FALLGIRL at checkout! Your Ombre Welcome Box features an ombre-perfect trio of polish shades and a smoky taupe gel eye glider! If you've been wondering how to get this hot, trendy ombre look on your nails – here's a quick tutorial from Julep! 1. Choose three polishes that blend well together, spanning from dark to light. Not sure what to pick? You can't go wrong with a deep, opaque color, a lighter shade of the same color, and white. Polish your nails with your darkest color. Allow them to dry. 3. Dip the edge of a cosmetic sponge directly into your dollops of nail polish then align the sponge so that the lightest color is at the tip of your nail. Press the polish onto your nails with the sponge, dabbing and repeating until you achieve the desired effect. This doesn't have to be precise! 4. Clean up the edges with our polish corrector pen or a thin brush dipped in polish remover. Finish with a top coat. Voilà! IMPORTANT NOTE: Keep in mind that by signing up for a Maven box, you are signing up to receive boxes on a monthly basis from Julep Maven (after this first month's box is sent for just $2.99 shipping, your monthly cost will be $24.99 for over $40 worth of products). You will be notified by email on the 20th of the month with a preview of the products they've customized for your next month's beauty editor Box. If you'd like to cancel the subscription, call the Julep Beauty Advisors at 877-651-3292; you must cancel by the 24th at 11:59pm (PST) to avoid being charged on the 27th. Check out these Strappy Riding Boots for $29.99! These boots are ultra cute! 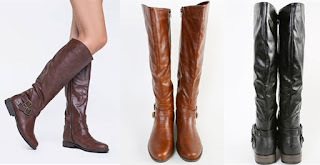 They feature a criss-cross strappy design that really makes these fashionable riding boots worth it. They are available in 4 different colors, too. Black, brown, chestnut, and taupe. Inventory is limited, so order soon! There's a small back heel and full inner zipper to make these easy for on-and-off wear. Materials are all man-made, animal/vegan friendly. Geesh it's a little high...$9.99 for the first item and $5.99 for each additional item. US only. Estimated to ship by Sep 24.